Definition at line 442 of file lltransfermanager.h. Definition at line 1266 of file lltransfermanager.cpp. Definition at line 446 of file lltransfermanager.h. Definition at line 454 of file lltransfermanager.h. Definition at line 459 of file lltransfermanager.h. Definition at line 460 of file lltransfermanager.h. Definition at line 458 of file lltransfermanager.h. Definition at line 456 of file lltransfermanager.h. Definition at line 455 of file lltransfermanager.h. Definition at line 457 of file lltransfermanager.h. Definition at line 1293 of file lltransfermanager.cpp. References lldebugs, llendl, mAgentID, mAssetID, mAssetType, mItemID, mOwnerID, mSessionID, mTaskID, LLDataPacker::packS32(), and LLDataPacker::packUUID(). Definition at line 1271 of file lltransfermanager.cpp. Definition at line 1286 of file lltransfermanager.cpp. Definition at line 1278 of file lltransfermanager.cpp. References mItemID, mOwnerID, and mTaskID. Definition at line 1306 of file lltransfermanager.cpp. References mAgentID, mAssetID, mAssetType, mItemID, mOwnerID, mSessionID, mTaskID, S32, TRUE, LLDataPacker::unpackS32(), and LLDataPacker::unpackUUID(). Definition at line 463 of file lltransfermanager.h. Definition at line 468 of file lltransfermanager.h. Definition at line 469 of file lltransfermanager.h. Definition at line 467 of file lltransfermanager.h. 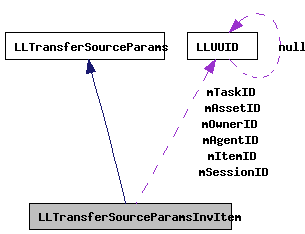 Referenced by getItemID(), packParams(), setInvItem(), and unpackParams(). Definition at line 465 of file lltransfermanager.h. Referenced by getOwnerID(), packParams(), setInvItem(), and unpackParams(). Definition at line 464 of file lltransfermanager.h. Definition at line 466 of file lltransfermanager.h. Referenced by getTaskID(), packParams(), setInvItem(), and unpackParams().